There's just something about a TomaTea escape game that calls to mind lazing around and being perfectly content with everything around you, and Spring Hotel is no different with its warm colour palette and mellow guitar soundtrack. The hotel room you find yourself trapped in is small but in a comfortably cozy way, albeit with puzzles and coded locks on every conceivable surface, which I hope was disclosed in the amenities list. The tip of your cursor will glow when it passes over something you can interact with, and as usual for TomaTea, if you're faced with a puzzle that has a clue to its solution you haven't seen, you'll be informed that you have no idea how to solve it. Don't forget to examine your items by clicking the tiny "i" icon that appears when you mouse over them! Doing so may let you manipulate them in a way that reveals more secrets. Nobody does "chill" in escape games quite like TomaTea, and Spring Hotel might have one of the most appealingly calming moods of them all. It strikes a nice balance between more obvious "use item X here" puzzles, and the kind you'll actually need to apply some thought to, though some are definitely more creative than others. At this point, it's practically a rule that if an escape game has any sort of remote control, you need to find batteries first. The more inventive presentations for some of the other puzzles more than makes up for this, however, tying in whimsy with logic so that none of the challenges are compromised in any way just to accommodate a certain aesthetic. Spring Hotel marries function and warm, fuzzy style to prove why TomaTea is so well loved, and is just the sort of escape you want to see even more of. Spring Hotel Walkthrough now available! Click on the left nightstand table. The present can be interacted with, but there's nothing you can do yet. Back up. Under the left pillow, find the DOLL'S HEAD. There is a picture above the bed with an outline of a girl's figure. On the right hand side table, pick up a PUZZLE PIECE (1/4) and the YELLOW HOUSE in the flowers. Pull up the blinds. Pick up the PUZZLE PIECE (2/4) and watch the silhouettes of the dancers. Check out picture of the goldfish on the left hand side. There are four cabinets. Underneath the TV there is a pick house and place to put three more. The mirror to the right is a closet, but we don't know how to solve it yet. By the door there is a large grid where you can change each square into yellow, red or gray. There is a screwdriver in a glass case beside the grid. On the other side of the door there is a clock, but it's too high to reach. This is for the large black grid by the door. I personally found this one pretty tough. You can turn each square red, yellow, or gray. Is anything else you can see those colors? The screwdriver. The point of this puzzle is the recreate the screwdriver in the large grid. Start in the top right corner. The shaft of the screwdriver is one pixel thick along the diagonal until the center of the grid. Then the yellow on the handle of the screwdriver is one pixel thick until the bottom right hand corner. Lastly, there is one pixel of red on either side of the yellow. Click the button to take the SCREWDRIVER. Click the switch to see the pretty picture behind the grid. There is room for four squares. What do you see oriented right and left? The goldfish above the puzzle. R L L R L R. Take the PUZZLE PIECE (3/4). Use the SCREWDRIVER on the screw underneath the pink house. Take the SCISSORS and the REMOTE with no batteries. Use the SCISSORS to cut the ribbon on the chocolate box. Yumm. Click on the matching chocolates in order to eat them all. Take the SPRING. The lock for the closet is a 4x4 grid. Where have we seen something that size before? Check a puzzle we have completed.. Enter the code from the chocolate box and take the STEP STOOL. You have to open it in your inventory before you can use it. Use the STEP STOOL to reach the clock. Turn it over and take the BATTERY. Put it in the REMOTE. Use the REMOTE to turn on the TV. The TV displays ROAD B. The only puzzle we are able to interact with is the one on the right, which allows you to input shapes. hmmmm. Input the shapes that are completely encircled by the letters in the code for each of the five spaces. Semicircle-circle-triangle-semicircle-two semicircles. Take the GREEN HOUSE and click the button. A flickering message will appear. Second Cabinet from the Left. This wants four letters. What message did we just look at? The only part of Spring Dance Show that is not flickering is RING. Enter this code. Take the DOLL'S BODY and the PUZZLE PIECE (4/4). Go back to the right hand side cabinet and use the SCREWDRIVER to take the RED BUTTON. By adding them to the place behind where you solved the screwdriver puzzle. Then turn the pieces to complete the picture. Take the WINDER. Use it on the clock to get the BLUE HOUSE. The Four Houses and Second Cabinet from Right. Add the SPRING to the compartment beneath the pink house. Add the RED BUTTON to the display case behind the houses. Click it to turn the light box on. What order should you put the houses in? What have you seen that were yellow, pink, blue and green? The birds on the picture you solved using the puzzle pieces. Blue, Yellow, Pink, Green. Click the houses. When they come back up, there is something inside their windows. Turn around to see the light box creating a code by casting shadows through the houses. 9526. Enter this into the second cabinet from the right. Take the DOLL'S LEGS. Put the pieces of the doll in place in the silhouette in the picture above the bed. You will find you can move the doll's arms and legs, but how? Remember the silhouettes in the window? Which one should you copy? The pink one. Take the KEY. Get outta here! 3 out of 4 tiles, girl's head, house on a stick, remote with no battery. Everything else seems to say that I have no clue how to solve this or too high! I think I found where the tiles go but I'm shy one. the puzzle in the hallway by the door? you should be able to solve the puzzle to get the screwdriver that's in the hallway to the right of the TV when you're facing it. 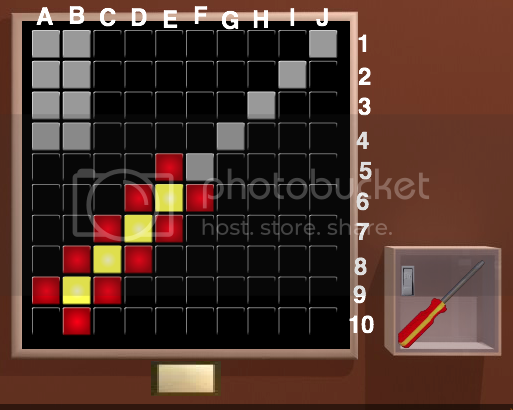 Re-create the image of the screwdriver using the coloured red, grey, and yellow tiles on the panel right beside where it's locked up. That screwdriver pixel puzzle was about as straightforward as a James Joyce novel. Thank you for the hint. the four houses lowered and raised with something (numbers, I'm guessing) in the middle, and the screwdriver in my inventory. go back to the rightmost cabinet with the red button and pull it out. The screwdriver puzzle is driving me crazy. I know what I have to do, but it's not working no matter how I implement it. I agree with all about the 10x10 grid. There are so many possible way to pixelate the screwdriver. Knowing how to solve this still leaves you to trial-and-error until you get it right. Not one of Tomatea's better puzzles, for sure. Wow! I had no idea so many people would dislike that puzzle. I honestly solved it my first try, so maybe I was just lucky? It seemed pretty obvious to me that everything was one "square" wide, so I just started with the tip of the screwdriver in the upper-right corner and worked down from there. I admit you have to eyeball the metal shaft's length, but everything else is pretty straightforward... one line of yellow, with one line of red on either side, all on the diagonal. Don't take that as humblebragging... I'm honestly surprised I had such an easy time of it if others didn't! I typically get hung up a lot more when I review these. using the screwdriver on the red button before pressing it. I had to start over, and made it out. I have to say - NOT my favorite Tomatea game. Yes, the screwdriver puzzle was very random, and confusing at first, but other than that...the game was overall pretty obvious and didn't have the 'Tomatea Charm' that the other games have. I, for one, was disappointed. thank you! I was looking all over for the matching colours -- except right in front of my nose. the screwdriver puzzle had me thinking, but once i realized the layout and colors it was a snap! Another great one from TomaTea - just as we've come to expect. Too bad the four-digit code was apparent well before the game allows it to be used after the backlighting is activated. Okay, I've made no more progress, so let's try this. Here is a screencap of my current best guess on the screwdriver puzzle; it doesn't work. I've added row and column labels for ease of reference. What do I need to change in order to get the correct solution? Had to restart because the remote control disappeared from my inventory, but out now. that it was simply a case of matching the pairs. I spent far too long trying to find a 'route' through that duplicated the same pattern! The screwdriver puzzle was poorly done. In particular, if each of the lines was supposed to be one pixel, the handle should have been a uniform cylinder rather than having thick and narrow parts. I thought the screwdriver puzzle was fine. Number one rule is do not over think a Tomatea escape. That, and the red above the yellow on the screwdriver is twice as thick as the red below the yellow. I kept trying to draw it like that. Silly me. Nevermind. I was way off...got it now! Me, too. Someone help us! anyone have a walkthrough for those that need it? That was some pretty chill music.